Love is a universal phenomenon experienced in every nook and corner of the world. Sadly, Hindi movies are often so preoccupied depicting the dating scene in urban scenarios they ignore the beauty of first romance and the nature of conflict it faces in small towns. It's hardly surprising then that some of our biggest love stories are centered on cool college kids. But with more and more filmmakers stepping forward to get out of the metros to concentrate on the stories of smaller cities, towns and villages, small-town is emerging as a popular backdrop in Bollywood. 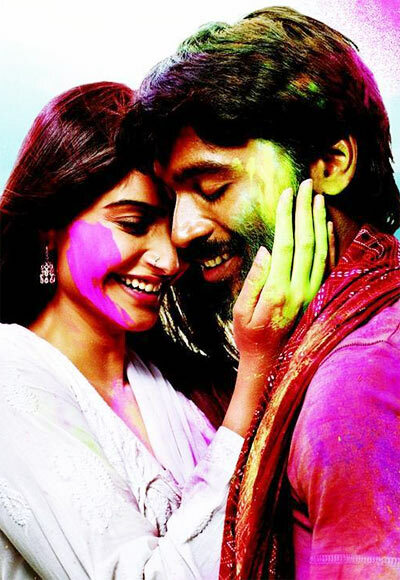 In Aanand L Rai's upcoming Raanjhnaa, Sonam Kapoor and Tamil star Dhanush are Varanasi residents entangled in matters of the heart. In a bid to lend the familiar genre some freshness, Rai has used the colourful, cultural venue to boost the flirtatious camaraderie between the two youngsters. Click Next to see the other small-town romances in Hindi cinema. Habib Faisal's version of Romeo and Juliet is set in quaint Almora where the children of two rival clans -- Parma Chauhan and Zoya Qureshi -- fall for each other after a prolonged battle of differences and deceit. Despite impressive performances from its young cast, Arjun Kapoor and Parineeti Chopra, Faisal's film faced flak for its regressive breakdown of its spirited leading lady. Before Raanjhnaa too, Rai set the quirky love story between the wacky Tanu and stable Manu in Kanpur against the marriage of their friends. 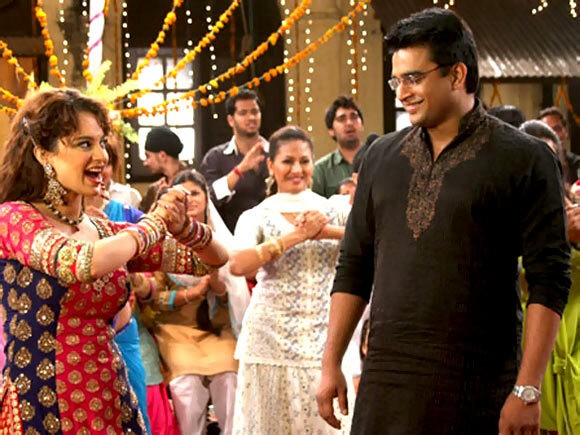 The vibrant setting lends its own earthy charm to this well-received Kangna Ranaut-Madhavan starrer. Set in Amritsar, Aditya Chopra's endearing love story is about a modest office-goer and the extent he goes to impress his pretty wife by embracing a dual identity. Together, they paint the calm Punjabi town red over a competition of gol gappe and dance sessions in the garage. Though not exactly a romance, there's enough attraction running between its three principal protagonists -- Naseeruddin Shah, Arshad Warsi and Vidya Balan -- to validate its title. Again set somewhere in eastern Uttar Pradesh, Ishqiya, before it takes a sinister turn, is about an elderly chap finding his heart turn 'bachha' for a woman half his age while the latter entertains a sly rendezvous with his impetuous accomplice. 'Chhote chhote shehron se...,' croon Abhishek Bachchan and Rani Mukerji -- hailing from small town India -- with big dreams in their eyes. How this desire brings them together, turns them into a notorious con team that swindles across Kanpur, Agra is what Shaad Ali's frothy Bunty Aur Babli is all about. Vishal Bhardwaj's adaptation of Othello is noted for its stark portrayal of the UP badlands but it's essentially a tragic romance. Ajay Devgn's intense Omi and Kareena Kapoor's pristine Dolly communicate the rise and fall of their relationship with memorable ardour in a rustic setting. He pursues her on a bike. She demurely smiles in approval perched on a cycle rickshaw. Director Tigmanshu Dhulia's paints a picture perfect small-town love story between Jimmy Shergill and Hrishita Bhatt until their togetherness is threatened by burgeoning local politics. Vidhu Vinod Chopra invested a lot of heart and soul in his ambitious young romance set in Rivalsar, Himachal Pradesh with a few-films old, eager-to-please Bobby Deol and doe-eyed Neha making her debut. Too bad, despite Anu Malik's breezy melodies, not too many wished to get close to the contrived melodrama. You can count on master filmmaker Basu Chatterjee to light-heartedly depict how a small-town romance develops between a enthusiastic school girl and a clumsy, wannabe wrestler in the face of miserly, disapproving parents and the aide of resourceful friends in the eminently watchable Chameli Ki Shaadi. It also helps that the rom-com boasts of terrific performances from both Anil Kapoor and Amrita Singh. PIX: Bollywood's extremely loud, over-the-top ladies!